The Sahara Desert is the largest hot desert on Earth (the cold desert of Antarctica is larger). The Sahara has played an important role in the development of African culture and history. The Sahara desert is located in North Africa. It covers much of North Africa stretching from the Atlantic Ocean to the Red Sea. North of the Sahara is the Mediterranean Sea. South is the Sahel region that sits between the desert and the African Savanna. The Sahara covers large sections of eleven different countries including Egypt, Libya, Tunisia, Algeria, Morocco, Western Sahara, Mauritania, Mali, Niger, Chad, and Sudan. The Sahara Desert is huge. It covers an area of 3,629,360 square miles and is still growing. From east to west it is 4,800 miles long and from north to south it is 1,118 miles wide. If the Sahara were a country it would be the fifth largest country in the world. Larger than Brazil and only slightly smaller than the United States. The Sahara Desert is one of the most consistently hottest places on Earth. The average temperature during the summer months is between 100.4 °F (38 °C) and 114.8 °F (46 °C). In some areas the temperature can exceed 120 °F for several days in a row. The overall climate of the Sahara makes it a difficult place for any life to exist. It is hot, dry, and windy. Even though it is so hot during the day, the temperature can drop rapidly at night. Sometimes to below freezing. It rarely rains in the Sahara. Some regions can go years without seeing a drop of rain. 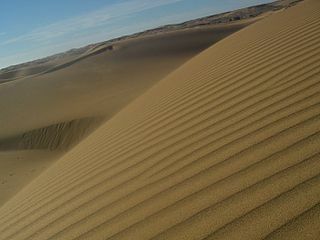 Dunes - Dunes are hills made of sand. Some dunes in the Sahara can reach over 500 feet tall. Ergs - Ergs are large areas of sand. They are sometimes called sand seas. Regs - regs are flat plains that are covered with sand and hard gravel. Hamadas - Hamadas are hard and barren rocky plateaus. Salt Flats - A flat area of land covered with sand, gravel, and salt. Even though it is difficult to survive in the desert, some powerful civilizations have formed in the Sahara. Larger cities and farming villages tend to form along rivers and oases. For example, the Ancient Egyptians and the Kingdom of Kush formed great civilizations along the Nile River. Some peoples, like the Berbers, survive by being nomads. They constantly move around to find new areas to graze their livestock and hunt for food. Trade routes across the Sahara Desert were an important part of the economies of Ancient Africa. Goods such as gold, salt, slaves, cloth, and ivory were transported across the desert using long trains of camels called caravans. The caravans would often travel in the evening or morning hours to avoid the heat of the day. The word "Sahara" is the Arabic word for desert. The Sahara used to be a lush region with many plants and animals. It began to dry up around 4000 years ago due to a gradual change in the tilt of the Earth's orbit. The highest point in the Sahara Desert is the volcano Emi Koussi in Chad. Its peak is 11,302 feet above sea level. Despite its large size, only around 2.5 million people live in the Sahara Desert. The most common language spoken in the Sahara is Arabic.